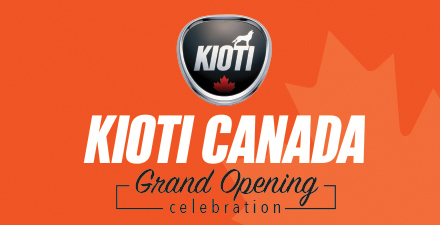 Receive an additional cash rebate on qualifying KIOTI tractors and UTVs. Stack Rebates to receive up to $4125 CAD on the CK10/CK10SE or $6075 CAD on the DK10SE! Canada Grand Opening Rebate: $300 CAD *See details below. CK10/CK10SE Cash In Lieu Rebate: up to $3625 CAD (Tractor, Loader, Backhoe) *See details here. Heroes Reward: $200 CAD *See details here. Canada Grand Opening Rebate: $500 CAD *See details below. DK10SE Cash In Lieu Rebate: up to $5375 CAD (Tractor, Loader, Backhoe) *See details here. Receive a $300 CAD cash rebate when a new qualifying CS, CK10, CK10SE, MECHRON, or K9 is purchased. Receive a $500 CAD cash rebate when a new qualifying DK10, DK10SE, NX, RX, or PX model tractor is purchased. Standard financing or low rate financing do apply.